This twice-baked soufflé is a comforting, warming dessert that’s smart enough for a dinner party when served with the gorgeous rhubarb compote. Put the compote ingredients in a pan, bring to a simmer, then cook gently for 10 minutes until the rhubarb is tender but still holds its shape (see Make Ahead). Strain, reserving the cooking liquid, then set aside. For the soufflés, heat the oven to 180°C/ 160°C fan/gas 4. In a medium pan, melt the butter over a low-medium heat. Mix in the flour and ground ginger to make a thick paste and cook for a minute or so until it smells biscuitty. Add the milk bit by bit, whisking until a thick white sauce forms. Add 2 tbsp of the rhubarb cooking liquid and 50g of the caster sugar to the white sauce, then whisk in the egg yolks and set aside in a large clean mixing bowl. In another clean mixing bowl, whisk the egg whites with an electric hand mixer to form stiff peaks (they will hold their shape when the beaters are removed). Whisk in the remaining 50g caster sugar for a minute to form a stiff, glossy meringue. Gently but briskly, use a large metal spoon to fold the meringue into the white sauce, then spoon the mixture evenly among the prepared moulds. Bake for 25-28 minutes. The soufflés should be risen, slightly golden and wobble a little when you take them out of the oven. Mix 100ml of the remaining rhubarb cooking liquid with the double cream (keep the rest to use in cocktails, if you like). When the soufflés are cooked, carefully turn them out and put one in the centre of each baking dish. 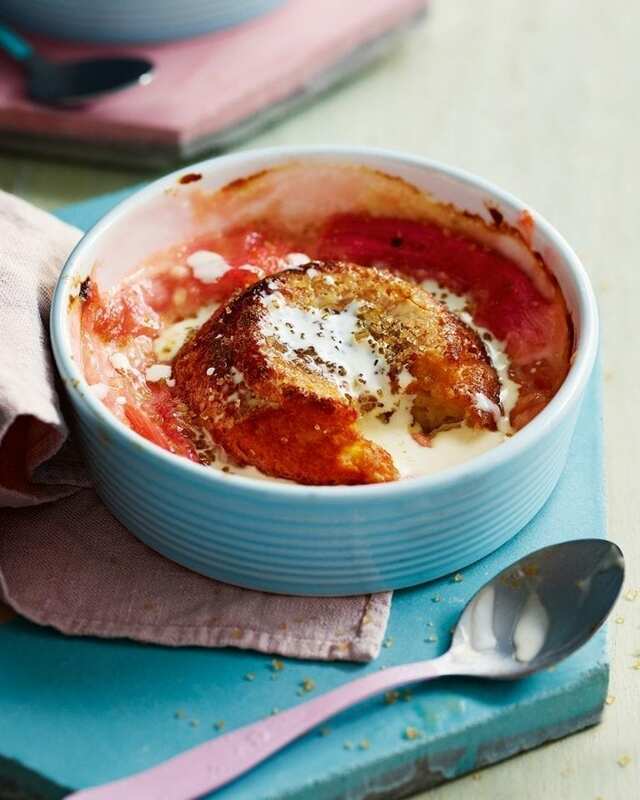 Pour the rhubarb-flavoured cream over each soufflé, sprinkle with brown sugar and spoon the strained rhubarb compote around the soufflés. Bake for 20 minutes until golden and bubbling. The sauce will be runny straight out of the oven but will thicken slightly as it cools. Make the compote up to 3 days ahead (don’t strain), then cover and chill. Turn out the soufflés at the end of step 4, cool, then wrap in cling film and chill for up to 24 hours or freeze for up to 1 month. Defrost if frozen, then finish the recipe from step 5.